I am a sucker for glittery and pretty things, sometimes. You wouldn't know it because I have a bit of a dark sense of humor! If you're looking for a little bit of flair for your Halloween party, take a look at Leopard Shop on Etsy. There are different styles that will fit any of your party ideas! 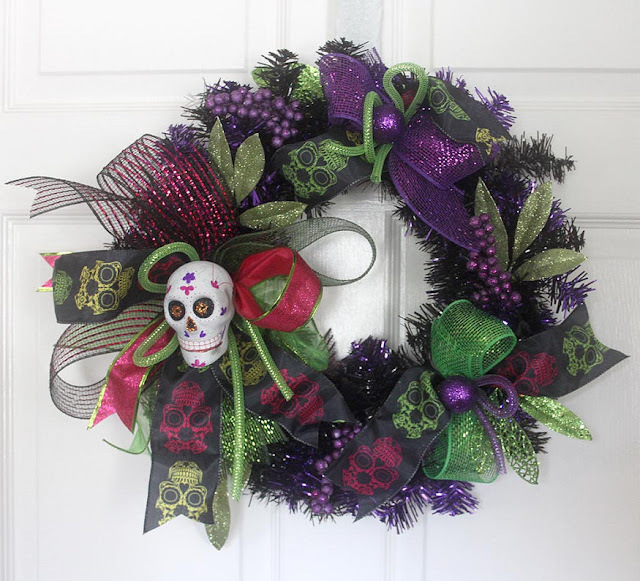 My favorite has to be the sugar skull wreath, because of the colors used. It's not too bright like most of the sugar skull items available! 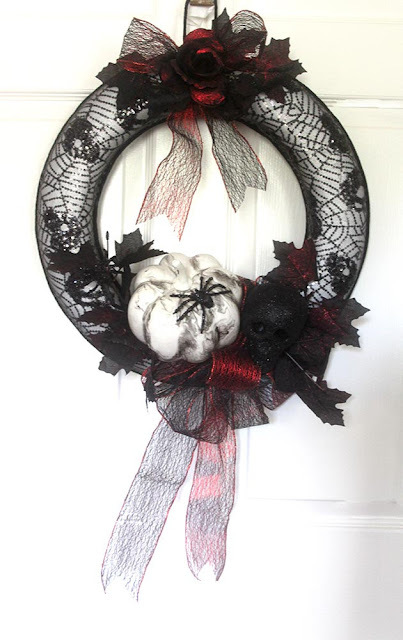 I love the Day of the Dead ribbons embedded in the wreath. You can set this Halloween mini skull arrangement on your mantel or your entryway table. The sinister twigs and leaves sticking out really give this piece a lot of malevolent character. 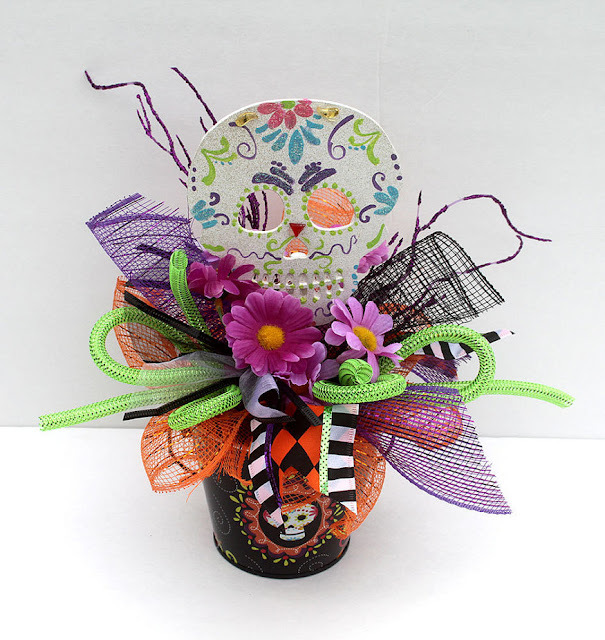 You can also have the very traditional styled sugar skull Halloween arrangement. This has all the vibrant colors you can ask for. The flowers are actually quite cute. I don't feel like it takes away from the spooky Halloween spirit. There's no doubt you could use this small Halloween skull wreath for many years. The colors are pretty generic, but it's still spooky! 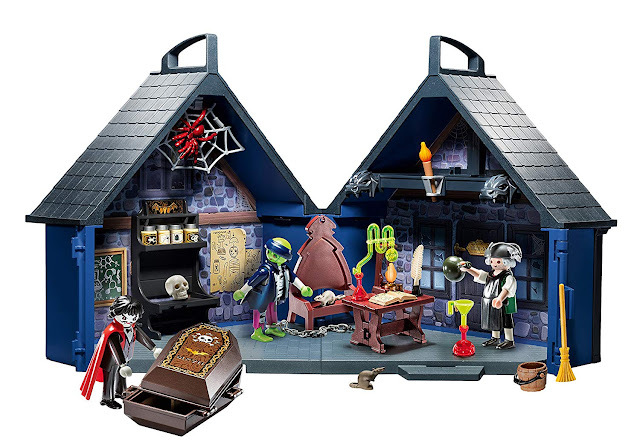 It's a great item for all Halloween themes. This Halloween wreath looks so sophisticated. 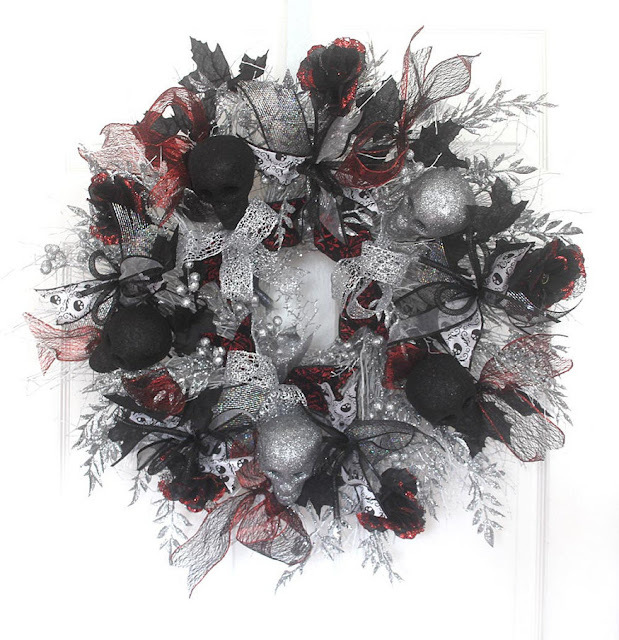 The deep red and black roses make this wreath great for a vampire party. 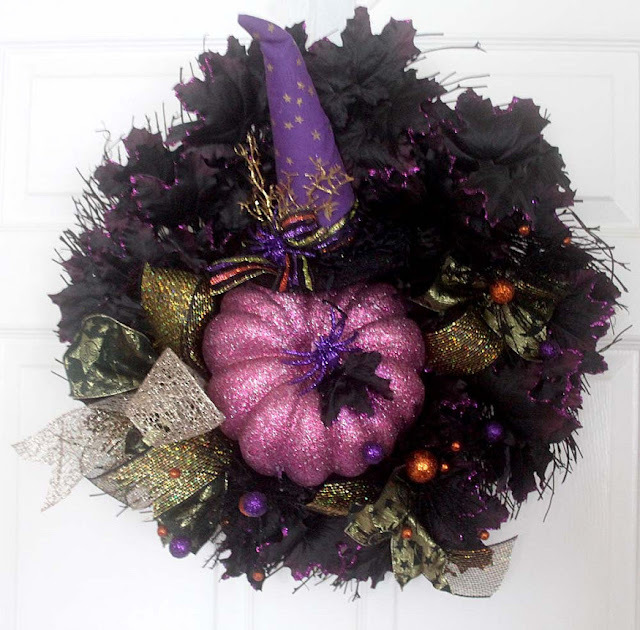 I think that this is quite a quirky purple Halloween witch wreath. Since it is so glittery it looks like a magic spell was cast on it. I hope it isn't a curse! 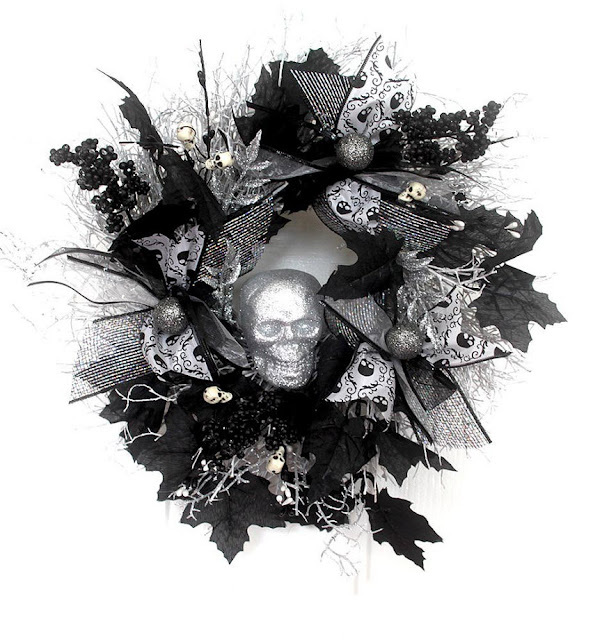 Doesn't this skeleton wreath look like it's supposed to be for wintertime? The silver leaves and ribbons look frosted over. 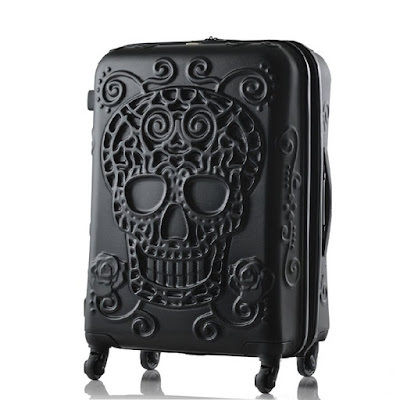 It's still very beautiful and has a lot of macabre elements. 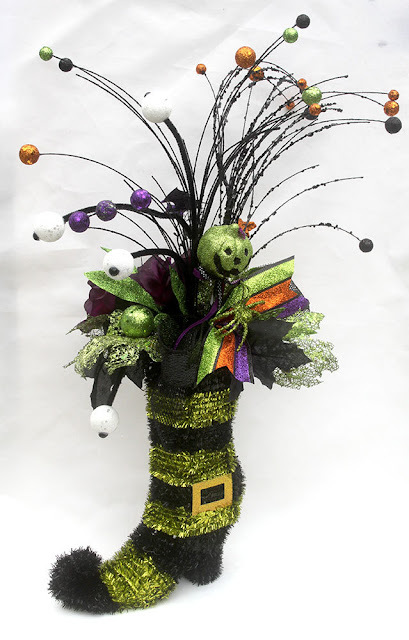 This whimsical Halloween witch boot arrangement is perfect for a witch themed Halloween party. I love the eye balls popping out of the boot! It almost looks like the boot is being used as a cauldron. 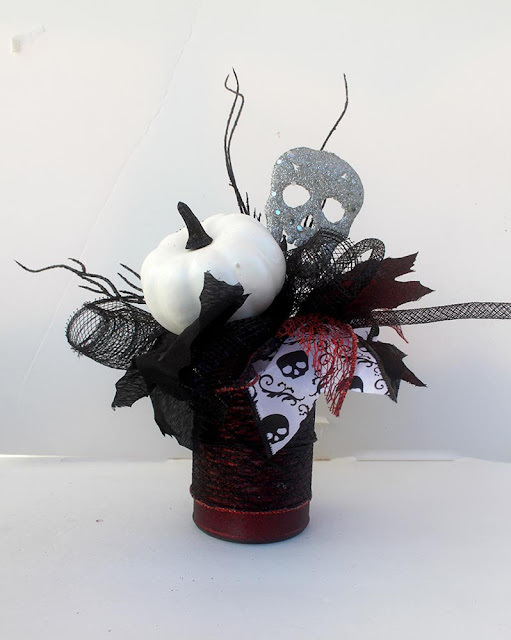 Do you like any of these Halloween arrangements from Leopard Shop on Etsy? Make sure to comment below and tell me which one you like the most!